Why, yes, it has been a long time since the last post. Thank you for asking. There were three comments qualifying for yarn. I couldn’t decide between them on merit, since they were all good reasons. I went to a random number generator and it said number 1 was the winner. Chronologically, the first comment was from Daisy. A skein of yarn will be heading your way soon. 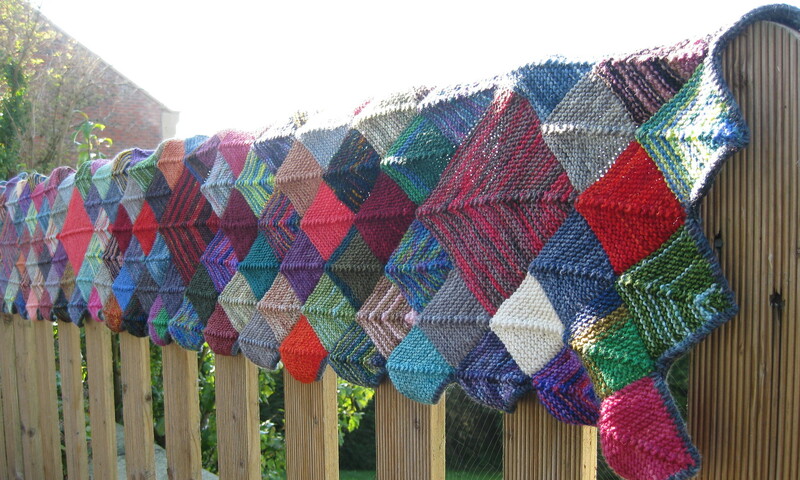 Seems a fair reward for getting me into this knitting malarky in the first place. Would you like to see the loot? Of course you would. I’ve been doing a lot of show and tell sessions when knitters come to visit. If you want to see the details, I suggest going to look at my ravelry stash, since it is all photographed and catalogued in detail. Since the beginning of November, there has been much knitting. I had been asked for a hat and hand warmer combination for Christmas from my sister. The hat was completed in mid-November, the hand warmers just after New Year – she enjoyed trying the half-completed hand warmers on when we saw her at Christmas. The hat was a heavily adapted design and the hand warmers were a completely new design, since I couldn’t find what I wanted on Ravelry. Where would you go to find an expert in how to make gloves fit really well? For socks I know that Cookie A or Cat Bordhi are good to go to when you want the technical details. Is there a gloves guru? 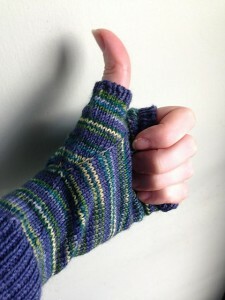 The reason for the delay in the hand warmers was that I decided to join the Sock Madness Advent Scarf knit-along. From December 1st to 24th, I awoke each day to an email with the next section of pattern in it. It was all in 2-colour stranded knitting and I really enjoyed it. I kept up with the schedule until the 21st December, then work got really, really crazily busy so I paused. The scarf is now upstairs, blocking, before I graft it together to make an infinity scarf. It is possible that I might have got the KAL bug because I’ve just started another one: the Ysolda Teague Follow Your Arrow Mystery Knit Along. Clue 1 was released on Monday, so if you want to join in there is still plenty of time. Oh wow, I won some yarn?!?! Cool. 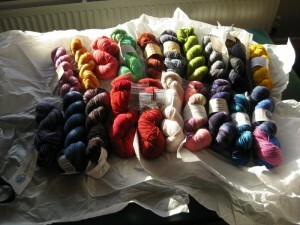 What a lovely haul of yarn you have there, I must plan a visit to come and see it. I mean you and the family. I still have no idea how you fit in all the knitting around everything else! !